It may be cold outside, but you will be guaranteed a warm, Scottish welcome in Glasgow any time of year and especially in winter. The average temperature in Glasgow may be 4� centigrade, but don't let that put you off. The City of Glasgow is jam-packed with things to do all year round, guaranteed to warm the cockles of your heart. Come to Glasgow for a winter shopping break any time during October, November, December, January or February and you will find plenty to do. There is great shopping to be had on the stretch known as the style mile and the areas around Argyle Street, Buchanan Street and Sauchiehall Street are full of shops for everyone's purse. There are also lots of boutiques to explore in The Merchant City. For covered shopping, take a day out at the Braehead Centre, with over 100 stores to choose from. For the more sporting, there is a wealth of activities at the Xscape Adventure Centre in Braehead, including the Sno!Zone. In keeping with the winter theme, Glasgow on Ice! 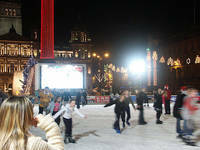 offers the opportunity to experience Glasgow city centre in a totally new context each year during the festive season when a public skating rink opens at George Square. Wrap up warmly and skate beneath the stars. For those taking winter breaks in Glasgow for its many cultural venues, a few days is simply not enough to take it all in. Choose from any number of galleries, museums and theatres such as Kelvingrove, the Transport Museum, the Royal Concert Hall or the King's Theatre. On Sauchiehall Street between the West End and the City Centre of Glasgow, stands The Sandyford Hotel, a 3* family-run hotel offering a warm welcome to Glasgow all year round. 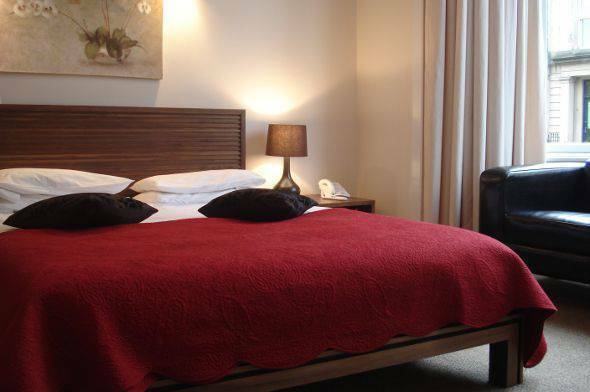 We have 55 bedrooms, which are tastefully furnished to a high standard of comfort. There are tea and coffee-making facilities in every room, along with plasma screen television and free Wi-Fi access. Our affordable B&B rates include a full Scottish breakfast to get the day off to a great start. Why not call The Sandyford Hotel in Glasgow on (+44) 0141 334 0000 to find out about available rooms and cheap bed and breakfast prices for your winter break in Glasgow. You can also contact us through our website, with the help of the online booking form.